White Smart Fab Cut Sheets are designed for smaller projects. Saving precious preparation time, White Smart Fab Cut Sheets are easy to handle and store and come in a convenient retail pack. Ideal for use with Smart Fab Rolls, these cut sheet packs can be used when large amounts of White is not required. 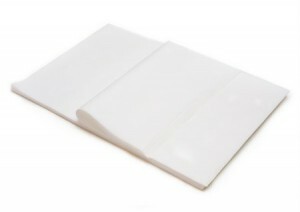 White Smart Fab Cut Sheet packs contain 45 sheets and are 30.5cm x 45.7cm in size.